I don't know how many of you noticed last Thursday's post about the Park-to-Park Highway in Montana. Before seeing the post card, I had never heard of the road. I did a quick Internet search expecting to find mention of some tiny road. Boy was I wrong! 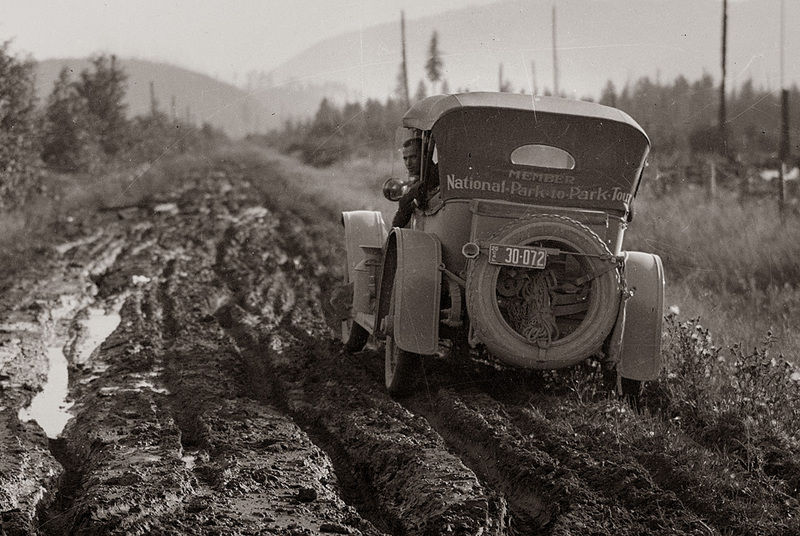 The National Park-to-Park Highway came to fruition through the efforts of Stephen T. Mather, the first Director of the National Park Service. 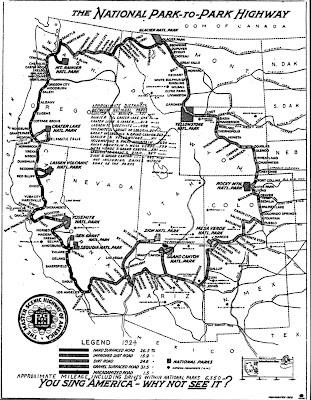 It was an automobile trail originally designed to connect a few parks, but eventually formed a grand loop through twelve National Parks in eleven western states, a drive of about 6,350 miles. 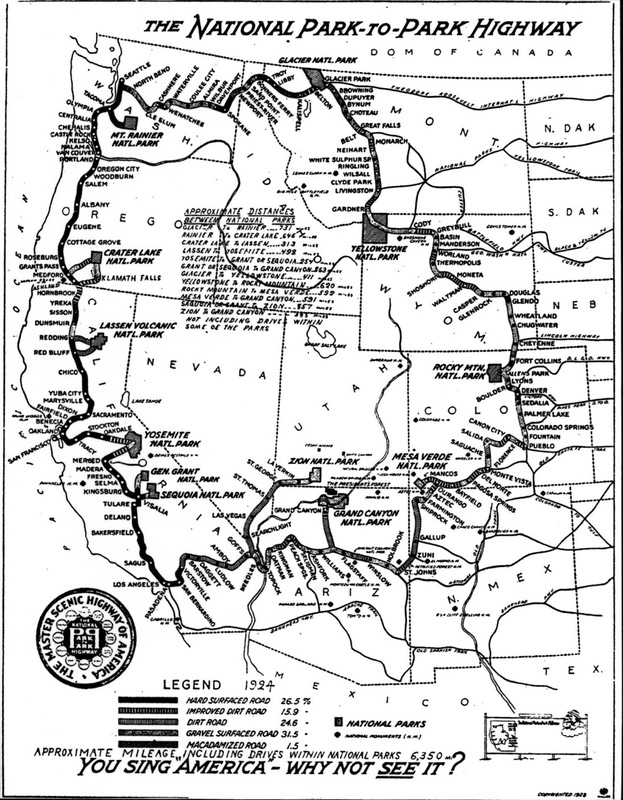 Even today, this would be a colossal road trip, but the highway was completed in 1920 when roads were mostly dirt and gravel. To plan the roadway, the National Park Service partnered with the American Automobile Association (AAA) and in 1920, a group of twelve men set out on an inaugural trip. The trip was rather sketchy, adventuresome journey, through often muddy roads and bad conditions, the journey departed from Denver and completed the counter-clockwise loop in 76-days. 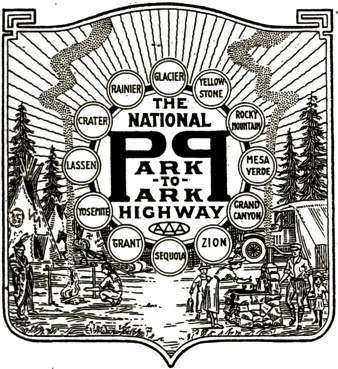 The publicity from the 1920 tour, brought many new visitors to the park and seeing America's National Parks by road became a new pastime. I've never seen it myself, but I remember hearing about it on that National Parks miniseries a year or so ago. Looked like quite an adventure! Elizabeth, I missed that series. I'll have to go look for it. A video is available for 24.95. How long would it take to do that trip nowadays? I had never heard of it, it looks like a good tourism opportunity. I would LOVE to take that trip now. I have driven coast to coast three times now and can't wait to take another "drive" somewhere. What a great idea! Only one problem - it will take years of convincing to get my husband to think it would be fun. Rob, good question. I went to Google Maps and they have the drive time for the loop at 83 hours, 15 minutes. Of course that doesn't calculate stops, refueling, sleep, or actually seeing anything at the parks (which really would be the purpose of the trip to begin with). To make the trip comfortable, you'd have to put a day's travel between each of the parks and then add whatever time in for actually seeing the sights. For example, just to see Yosemite Valley, which is a small part of the park, I'd suggest two days minimum. LOL! No, Nate, we didn't drive to our vacation this year. My daughter is in college in Baltimore, so I did make the trip last year to deliver her car to her. It was delightful to see things along the way and frustrating to not have time to see everything. You are right this park trip would require plenty of travel time plus separate park time to make it worthwhile. I can't imagine how reliable the cars were then. 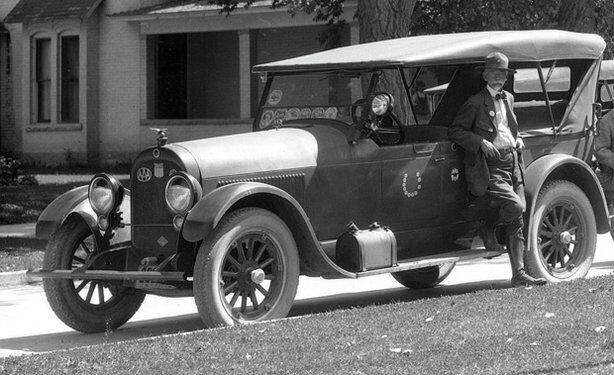 There was a two-part program on PBS tonight about that 1920 trip. A 72 year-old woman drove about half of the trip! Today, that trip would be a great three-week vacation! Let's do it!